A darn nice bass. 25 lbs. even, caught outside San Diego. 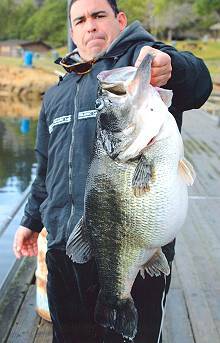 Story here.�With freshwater fish, you learn to display them towards the camera, to make them look more impressive - but this is a big fellow. Stumbled upon a good website. The Real Cuba. Opie would like it. Lots to peruse. I was taught that Tulipmania was real. Now it is thought that it was a myth.�Tulips are OK, but far from my favorite flower. Four months of Dems in Power. Kudlow. Same old. Thinking big about fuel, from an engineer's brain. Small Dead Lemmings. You need to read the whole thing. Ten billion served, and hundreds of millions fleeced. Transit subsidies, at The Commons. We usually agree with The Commons, but there is no comparison in the piece with the federal subsidization of highways.�I am�opposed to the latter, sort-of. Bush's greatest speech. Kim. I could have written that. Medical insurance should cover this. All male Coyotes need them. Eurabia. Add Kyoto to the mix, and they could create a new Afghanistan! Classical Values. How experts think. A Parliament of Clocks, via Kim, via Instap. how come the Real Cuba does not list who they are anywhere on the site? FYI I can send you photos of similar poverty before Castro's regime. Clearly very one sided view point as I believe the embargo does not benefit anyone especially the poor Cubans and prevents the ideals of democracy to flow there. Agree about the embargo. The embargo is driven entirely by Florida politics, and it is silly. Forgot to mention that the embargo was not silly when Fidel was basing Russian nuke missiles. Florida is an important "swing state." That's the reality.